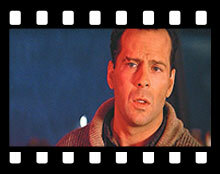 Bruce Willis' defining film role was John McLane, a tough New York cop in DIE HARD. His other notable films include: PULP FICTION, DIE HARD WITH A VENGEANCE, 12 MONKEYS, LAST MAN STANDING, ARMAGEDDON, and THE FIFTH ELEMENT. THE SIXTH SENSE is Bruce's biggest box-office hit to date. After tending bar in New York, and then achieving stardom on TV in Moonlighting opposite Cybil Sheppard, Bruce Willis achieved movie superstardom in the 1990s. Although Willis frequently sports a wig, or partial hairpiece, he appeared in films like PULP FICTION and 12 MONKEYS with little or no hair and still kept his fans. Bruce Willis was married to superstar actress Demi Moore. Bruce Willis with his PULP FICTION co-stars.